Crescat nailed the oil trade in 2014, helping our hedge funds deliver some of the best performance in the industry. Crescat Global Macro Hedge Fund was recognized by both Preqin and BarclayHedge as a top-10 performing macro hedge fund with a 25.8% net return. Crescat Long/Short Fund delivered a strong 23.2% net return, in the top 5 percent of the 723 long short hedge funds that report to eVestment. All three strategies continue to perform well in the first quarter of 2015. 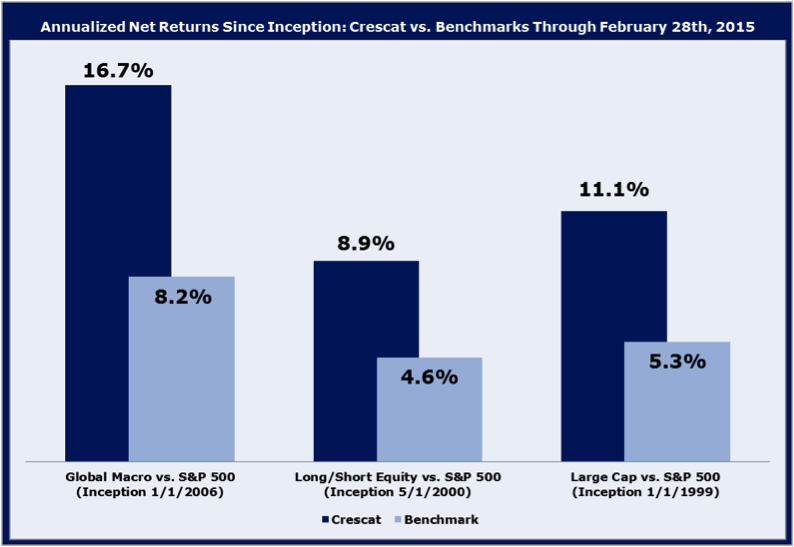 Through February, Crescat Global Macro and Crescat Long/Short hedge funds were up 6.5% and 3.7% net, respectively. Crescat Large Cap was up 5.2% net, while the S&P 500 Index was up only 2.6%. Both hedge funds are up in March as well with Global Marco up 2.4% net and Long/Short up 1.7% net while S&P 500 Index is down 1.0% month to date. Large Cap is down 0.2%. Crescat has delivered exceptional value to its clients in the long run compared to the universe of professional money managers and the major benchmarks. Net of fees, all three of our products have beat their benchmarks and the vast majority of our peers since inception on an absolute and risk-adjusted basis. See Alpha and Omega Ratio in our performance reports for risk-adjusted performance versus two benchmarks for each strategy. Also, refer to the eVestment scatterplots of Alpha vs. Gain-Loss Ratio on our website that show each strategy’s performance compared to peer managers since inception. In this letter, we discuss performance attribution across Crescat’s diverse macro themes for last quarter and year to date. We also provide our investment outlook. The Crescat Investment Team’s anticipation of the recent slide in oil prices based on our macro theme, New Oil and Gas Resources, contributed strongly to our returns in 2014 and early 2015. This theme has contributed 8.4% to Global Macro net returns in the last five months. Performance was largely driven by our equity shorts in highly-leveraged oil and gas exploration and production companies, as well as shorts in upstream master limited partnerships. Short positions in Brent and WTI crude oil futures also added measurably to returns in the fourth quarter of 2014. Some of the most successful short positions in this theme have included Breitburn Energy Partners, Market Vectors Russia, Linn Energy, Legacy Reserves, and Bill Barrett. We remain short a select basket of Exploration and Production companies (E&Ps) and oil service companies that we believe have more financial distress ahead. After analyzing the major oil price shocks that have occurred since WWII, we believe that oil prices may drift marginally higher over the next few years but will largely remain depressed as we discuss below. Today’s situation in world oil markets most closely parallels the dramatic price decline in the mid-1980s. In both cases, a period of prolonged high prices enticed significant exploration efforts. This eventually contributed to dramatic increases in supply, which ultimately resulted in rapid price declines and prolonged depressed prices. Thirty years ago, it was unrest in the Middle East that led to high prices beginning in the early 1970s. Those high prices encouraged exploration and production on a large scale, especially in Alaska and North Sea oil fields. 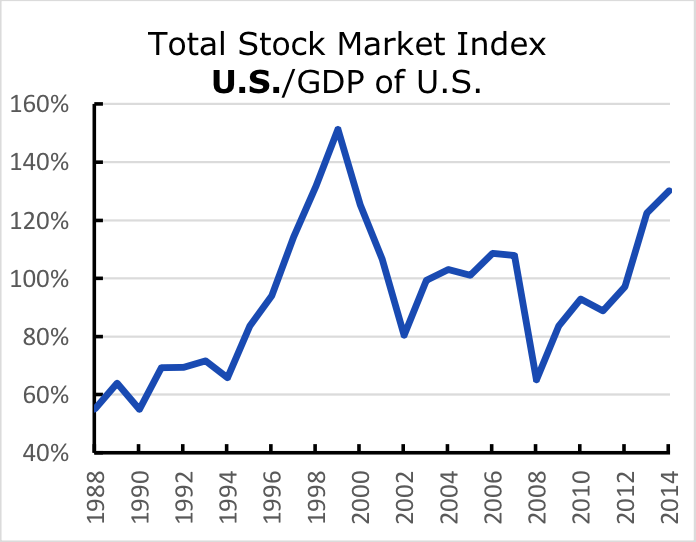 When the market finally reached the tipping point in the mid-1980s, prices dropped by about two thirds and were slow to recover. 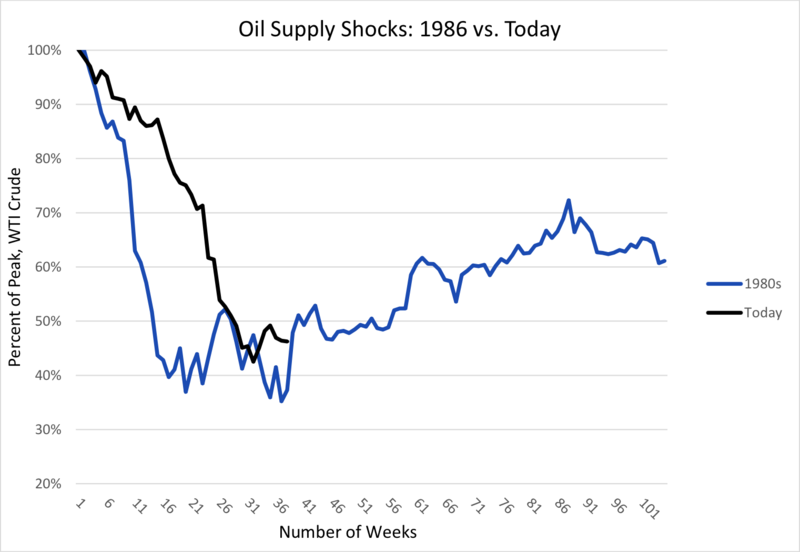 We show the relationship between the mid-1980’s supply shock and the current one in the chart below. For comparison, below, we have rescaled the peak price of oil in each period to 100 in order to show the comparative percent change over a two-year period. The actual peak price of oil was $32 in the fourth quarter of 1985 and $108 per barrel in June of 2014. In the current situation, oil prices have generally been high and increasing since the early 2000s, with the exception of the demand shock in 2008. There are numerous reasons for the high prices over the past fifteen years on both the demand and supply side of the equation. Strong demand growth from China and other emerging markets, Peak Oil rumblings in the mid 2000s, and Arab Spring tensions more recently have all contributed to elevated oil prices. The prolonged period of high prices gradually encouraged the development of new technologies and increased capital investment. Using a combination of directional drilling, reservoir analysis, hydraulic fracturing, and pressure pumping, entrepreneurs and engineers in the U.S. tapped our country’s vast shale formations, dramatically increasing total oil and gas production over the last five years as we show in the chart below. Over this period, U.S. crude oil production went from 5.5 million to 9.3 million barrels per day, a 69% increase. Crude oil production from just three U.S. shale reservoirs alone (Permian, Eagle Ford, and Bakken) expanded from about 1 million to 5 million barrels per day, accounting for essentially all of the net increase in oil. 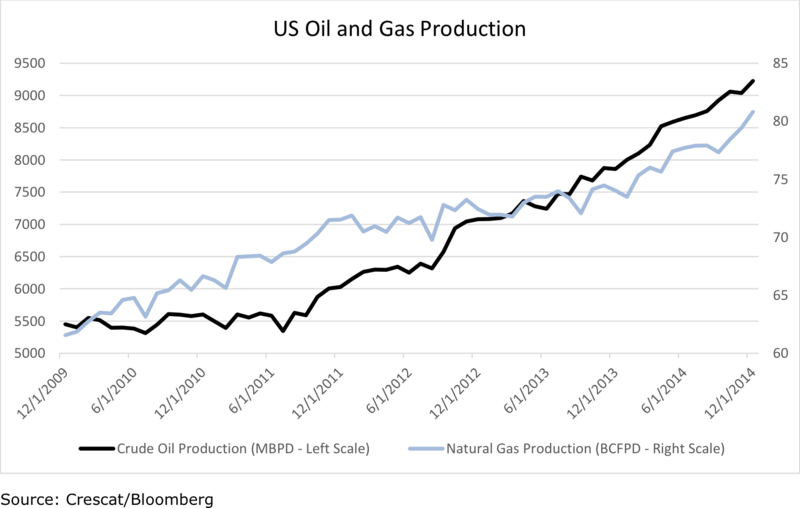 Natural gas production went from 62 to 82 billion cubic feet per day, a 32% increase. During the years leading up to the recent oil price drop, Crescat’s macro themes and fundamental equity model pointed towards many successful long positions in pipelines, oilfield service companies, and refiners. We were able to benefit from the boom times, as new investor capital flooded these markets and drove stock prices of these players higher. But many of these companies began to drop in our model rankings in the last year. Exploration and production (E&P) companies, which our model has already been wary of for the last few years, dropped precipitously in our rankings as oil prices began to break in July 2014 last year. It was the catalyst for us get short a basket of them. 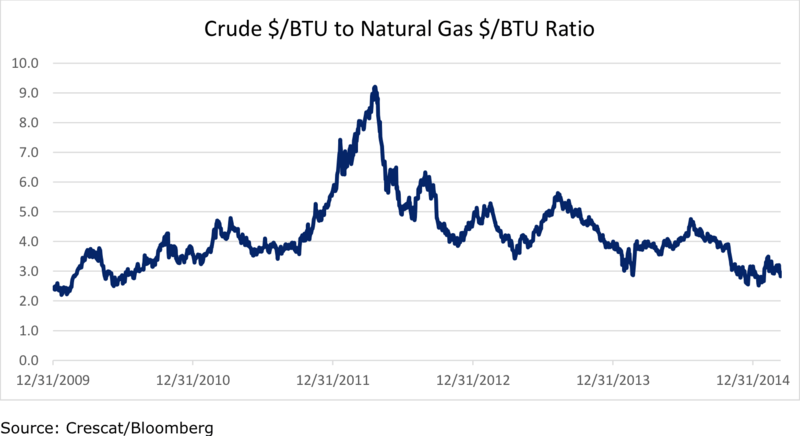 On the macro research side, we have believed that oil prices were unsustainably high since 2012, when WTI crude oil became historically overvalued relative to natural gas on an energy equivalent (BTU) basis. At the time, we believed that crude oil would ultimately come down just as natural gas prices did as a result of the U.S. shale gas supply boom. We put on a BTU spread trade (short crude and long natural gas futures) as a hedged way to take advantage of the ultimate convergence. This has been a successful trade for us that we have had on for the better part of the last three years. We first put this trade on soon after the front-month BTU spread peaked at 9:1 in March 2012 and began to drop, as we show in the chart below and as we have written and talked about for the last three years. You can see in the chart that the spread has gradually come down to just under 3:1 today, and the current ratio is still above the long term average of 2:1 over the last 25 years. The decline in crude prices over the last nine months has been almost identical to the 1986 decline. We expect the price of crude oil to continue to hammer out a bottom today with a slow recovery to follow, just like in 1986. We believe there will be no “V” shaped recovery where WTI rebounds to $100 within a year. It is important to note that two years (104 weeks) after the 1985 peak, WTI crude was still only at 60% of its peak. Because this is a similar supply shock, our estimates are that oil (West Texas Intermediate) will stay below $60 per barrel in 2015 and below $70 per barrel in 2016. It is also important to understand that even if and when oil rises into the 50s, 60s, and 70s, it will continue to be a very difficult operating environment for most U.S. oil and gas companies. Many of these companies have already expanded their balance sheets dramatically under the assumption of higher oil prices. However, most of them were not even generating positive free cash flow when oil was above $80. We expect a lot more problems in the energy sector given our depressed target range for oil over the next two years. Highly leveraged exploration and production companies with high production costs and unproven assets will be under significant financial distress in this price environment. The bull thesis for financially strapped E&Ps rests on the hope that they are M&A prey, but such thinking seems more like M&A prayers. The valuations are still stretched and no buyer in their right mind would take on these companies’ high debts in this environment. The strongest companies in the sector are under enough distress already themselves. It will be better for the relatively strong to wait it out and cherry pick assets in bankruptcy and other fire sales. The capital markets to the energy sector will be drying up fast. Financing for M&A will be sparse. It was a capital market financing bubble that funded the shale boom to begin with and it has kept the energy sector afloat with unprecedented new equity and debt offerings, particularly among the E&Ps. This financing also was responsible for a Master Limited Partnership (MLP) Bubble that began with midstream (pipeline, gathering, and processing) and expanded into other energy industries like Liquefied Natural Gas (LNG) export, E&Ps, and refiners. Our model has flagged many of these MLPs, in addition to the E&Ps, as potential shorts. Many of these other MLPs have negative free cash flow, high debt, and astronomical valuations. The MLP Bubble lured unsuspecting retail investors, even sophisticated institutional ones, with perceive high dividend yields. But the dividends of most of the MLPs that we have analyzed are only sustainable as long as new investors keep coming in. It is a classic Ponzi scheme. The scheme is still being revealed today amidst much denial. Too many companies in the energy sector (and not just the MLPs) have become reliant on new investor capital, as opposed to operating cash flow, to finance these capital intensive business. Negative free cash flow is a sector-wide problem. As for the tax benefits of MLPs, buying into a money-losing business for tax benefits is always a bad idea. At the end of the road, we think most MLP investors will only have gotten some of their capital back as tax-advantaged dividends. The balance of what they invested will be a tax write-off, due to a real capital loss. Dividends are already being slashed. More carnage lies ahead. Outside of the energy sector, lower oil prices will have a net positive impact on the U.S. and other oil importing economies. The extra cash in consumers’ pockets from lower prices at the pump is one of the key drivers of our new Consumer Comeback theme, which started taking shape for us in the fourth quarter. Two other pillars of this theme, as it relates to the U.S. consumer, are the strong dollar and improving labor markets. We have initiated positions in a basket of consumer discretionary companies favored by our model. Electronic Arts has been a particularly successful position in this theme. The video game maker has several franchises that produce new products annually, keeping the consumer engaged and coming back for the latest and greatest version. Other successful recent positions have included Bed Bath & Beyond, Lululemon, Priceline.com, and Zumiez. We also have a position SPDR S&P retail ETF as a macro play to gain exposure to a broad swath of retailers. The Consumer Comeback theme has contributed approximately 1.8% net returns to our Global Macro Strategy in the last five months. 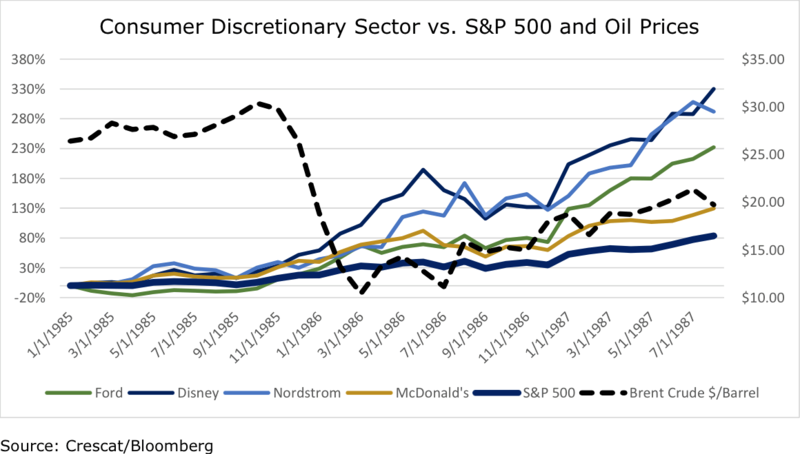 The chart below shows consumer discretionary stocks strongly outperforming the S&P 500 in the wake of the oil supply-shock price collapse in 1986. Our Digital Evolution theme has also been a big contributor to returns, particularly during the first two months of 2015. Many of our tech stocks have performed strongly, but among our biggest winners are Akamai, Corning, and Nvidia. Akamai’s focus on internet content delivery optimization and Corning’s market-leading Gorilla Glass for cell phones contributed to strong earnings beats for both companies. Nvidia’s dominance in graphics processors (GPUs) for gaming and PCs has generated strong free cash flow growth historically. Nvidia holds thousands of patents, used internally and also licensed to other big players in the tech industry, and consistently seeks to defend and expand its licensing agreements with the likes of Qualcomm, Samsung, and Intel. The company is wisely expanding into big new markets including desktop/cloud virtualization, data centers, and deep learning for automotive, continuing to make it a very exciting yet underappreciated value stock today. Digital Evolution contributed 4.4% to Global Macro net returns in the last five months. For a deeper dive on Nvidia, watch Kevin’s Nvidia presentation last June to a group of money managers at the ValueX conference in Vail. Our short currency positions against the dollar, including the euro, yen, British pound, and Australian dollar, have contributed more than 3% to Global Macro net performance during Q4 2014 and through the end of February 2015. These trends have continued, and accelerated in the case of the euro, during March as the Eurozone embarks on QE and the US creeps closer to the potential of an interest rate increase. Crescat maintains well balanced, diversified exposures to a variety of non-correlated macro themes in the portfolios at any one time. In the last five months, Nanoscale contributed approximately 1%; India Policy Shift contributed approximately 1%; Debt-to-GDP Resolution contributed approximately 0.9%; and China Currency and Credit Bubble contributed approximately 1% net to overall returns. Among all twelve of our active macro themes in the fund over the last five months, eight of them delivered positive performance and none of them lost more than 1%. With U.S. banks holding close to $2.4 trillion in excess reserves, and the FED raising interest rates, we should expect banks to start lending again. We are excited about the prospects for our Domestic Bank Resurgence theme. New loan growth in the U.S. together with increasing net interest margins and reasonable valuations should present a good environment for U.S. banks over the next few years. We own two bank ETFs in order to get broad exposure to this macro theme. We also have a Fed Moderation theme to hedge against the risks of rising interest rates in the U.S.
With respect to our Global Debt-to-GDP Resolution and Global Fiat Currency Debasement themes, the majority of developed economies suffer from the same problem: high debt to GDP and sluggish economic growth. Most economists who look at the ramifications of high debt to GDP fall into two camps: 1) Those who believe that high debt-to-GDP economies are mired in deflation, and 2) Those who believe that we are headed for inflation in order to deleverage debt to GDP. The valid arguments from both camps boil down to the same conclusion: Expect continued monetary stimulus from the world’s central banks and ultimately inflation. Just in the last three months, we have experienced more than ten different central banks announcing some sort of easy monetary policy in order to boost their economies. The ECB decided to resume its bond purchases program. 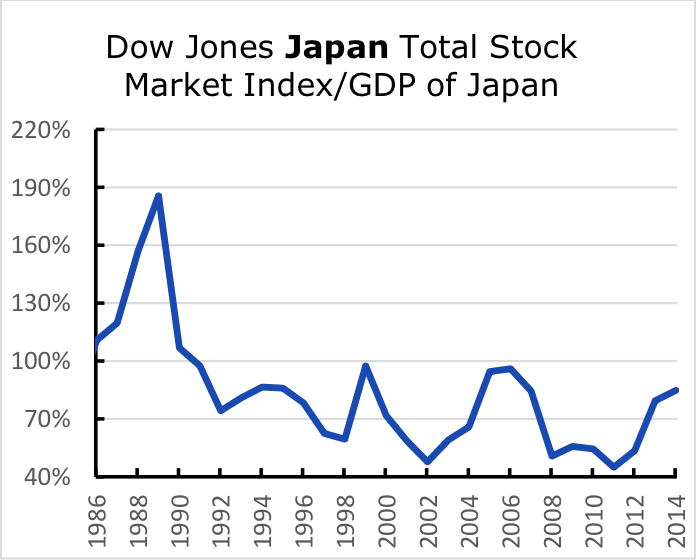 Japan is continuing its quantitative easing (and is also considering other forms of easy monetary policy). Switzerland, Denmark, Egypt, India, Canada, and South Korea addressed this issue by cutting interest rates. Singapore has announced that it will manipulate its exchange rate, in order to prevent its currency from appreciating relative to the U.S. Dollar. Also, China lowered its reserve requirement ratio by 50 basis points. Several countries in the Eurozone, UK and Japan continue to have unsustainably high debt to GDP. With slower nominal GDP growth, these countries will be pressured to apply more monetary stimulus to their economies. We have successfully been short the euro, pound, and yen relative to the dollar as part of our Global Debt-to-GDP Resolution (aka Global Currency Wars) theme. We continue to hold these positions as we see further depreciation ahead. We believe that European stock markets will do well in this environment. 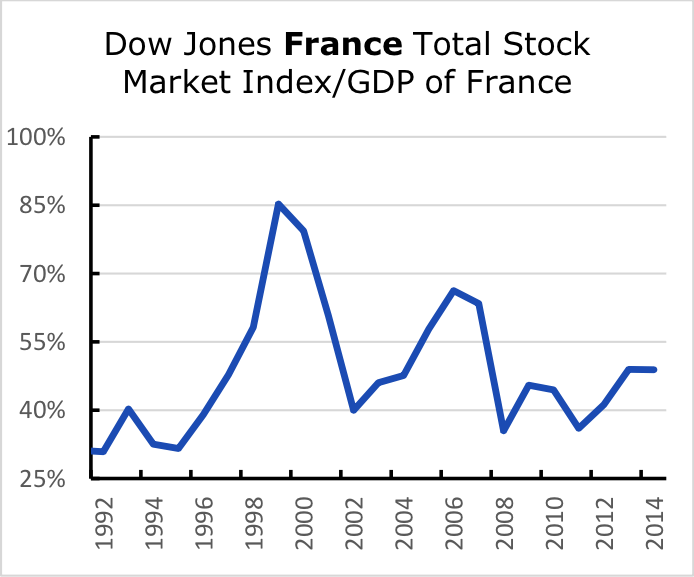 The valuations in countries such as Germany and France are reasonably cheap based on total stock market value-to-GDP comparisons, which we show in the charts below. Crescat is currently long European stocks, which appear more attractive than U.S. equities today as long as one can hedge the currency risk of likely further euro devaluation. In our Global Macro Fund, we are able to hedge the currency risk through currency futures. In all of three strategies, we own currency-hedged ETF’s in Europe, including Wisdom Tree Germany and Wisdom Tree Europe. We believe strongly in hedging the currency risk when getting long European equities. As you can see above, U.S. stocks are starting to look expensive today relative to GDP, particularly with the prospect of Fed rate tightening in the not too distant future. Accordingly, we have been increasing our diversification outside the U.S. We have also been increasing our short exposure in U.S. stocks, yet we still remain net long of individual U.S. stocks and sectors that have good valuations and strong fundamentals. 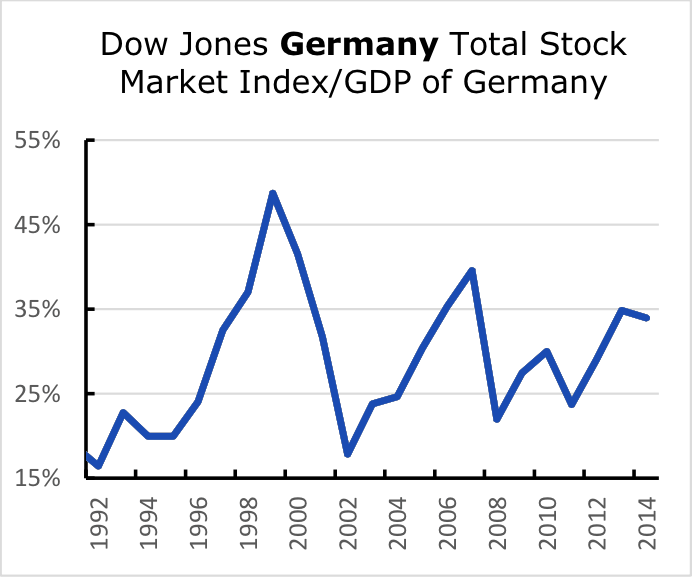 The generally improving U.S. economy with its strengthening labor market, strong dollar, and low energy prices positively affect certain sectors, particularly financials and consumer discretionary, as we discussed above, while other sectors like biotech, energy, utilities, and consumer staples look expensive. The China Currency and Credit Bubble is one of our highest conviction themes in the Global Macro Fund today. China sits atop a real estate and credit bubble that may be the largest of any major global economy in history. The unsustainable capital investment boom in China that we have written about for several years has finally reached the point of exhaustion. Empty buildings. Empty cities. Halted construction projects everywhere. Lack of demand. Lack of new financing. Mass capital flight. Division within the party. Political clampdown. Corruption pervades the Chinese communist party-state and society. China’s economy is a shambles. Warning: There is risk of severe recession, civil war, revolution, and hyperinflation. Capital invested in China is highly at risk. With an M2 money supply of $19.6 trillion, 69% larger than U.S. M2, but a GDP of only $10.2 trillion, 42% smaller, there is no question that China is in a currency and credit bubble. According to McKinsey Global Institute, total debt to GDP in China is 282%, a dangerously high level for an oppressive totalitarian regime on the precipice of a domestic real estate and banking crisis. We think the Chinese economy is headed for a colossal train wreck that may parallel the breakdown of its fellow communist giant, the former Soviet Union. Do you think investing money in China is safe? 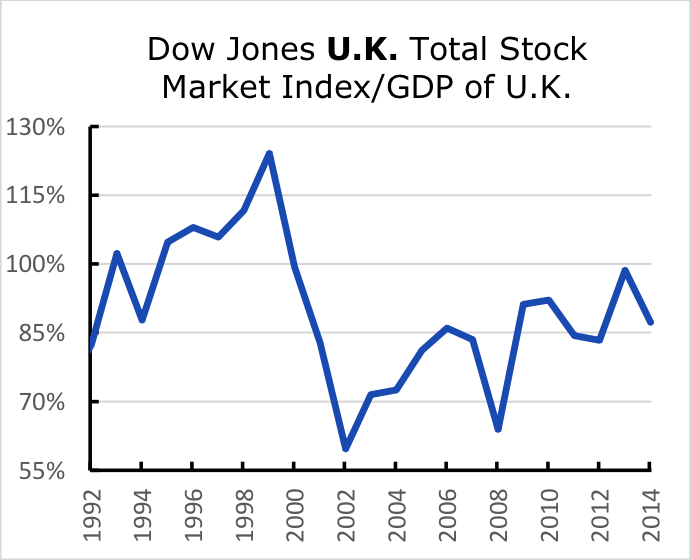 Or that its stock market is cheap like the chart stock market to GDP chart above might imply? Think again. One must always consider currency risk when investing in foreign stocks. Consider if you were holding ruble-denominated assets prior to the breakup of the Soviet Union in 1991 when the ruble was devalued by 77%. Then again prior to the Russian Financial Crisis of 1998 when the ruble dropped another 70%. Or a year ago, before continued economic problems Russian economy caused a 44% drop in the ruble in the last year. When a foreign currency crashes, the value of your assets held in that currency go down in dollar terms by an equal amount. In the case of Russia, each episode of ruble devaluation was marked by mass capital flight among the wealthy from the country. The Russian example provides too many parallels to ignore. It also shows that the death throes of corrupt authoritarian communist regimes can be messy and prolonged. If there is one takeaway from the other communist crackup, there is a clear future direction of the yuan. 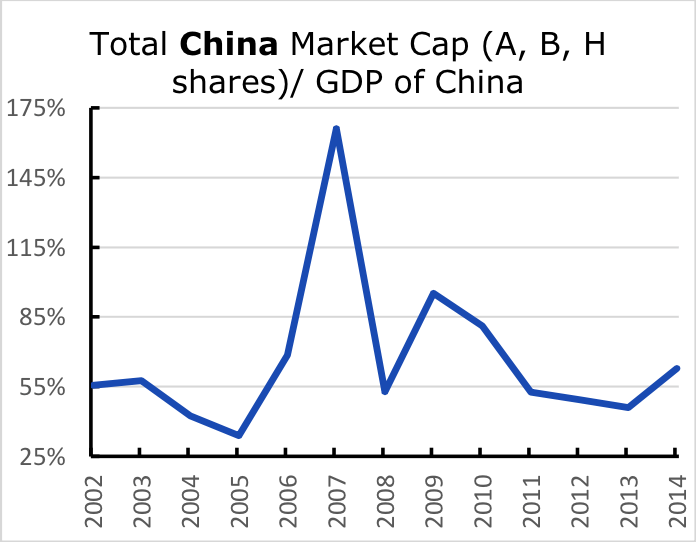 China’s economic elites have already been engaged in mass capital flight for the last fifteen years, but they have covered up its magnitude. It has been has been disguised by the country’s phony balance of payments (BOP) accounting. Over this time, China has been reporting twin surpluses in its BOP accounts. In other words, both China’s current account and its capital account have been positive for almost all of the last fifteen years. In the real world, a country’s current account and its capital account must net to zero. If a country maintains a large trade surplus, it must have an offsetting capital account deficit. One can easily identify that the discrepancy in China’s books is within the capital account, because China does not report its illicit capital outflows. They are enormous. There is no capital account surplus in China. There is a capital account deficit. Taking the BOP data that China does report and solving for the missing capital outflows, we find they have averaged $527 billion per year over the last fifteen years. That’s $7.9 trillion in cumulative undisclosed capital outflows. This amount is more than the $5 trillion of foreign direct investment inflows that have come into China over the same period, which they have reported. What this really means is that $7.9 trillion has already surreptitiously fled China and, as in the Russian case, is likely never to return. Another concern is that China has accumulated $3.8 trillion in foreign reserves. If true, and it certainly was at one point, it represents an immense quantitative easing (money printing) relative to GDP. It is remarkable that China was able to get away with this level of QE at the same time as $7.9 trillion was fleeing the country. Yet China is no longer reporting increasing foreign reserves. These peaked in June of last year at $4 trillion. This is a major warning sign, because we believe these foreign reserves are already more than fully encumbered today, and no longer represents a war chest. How could China possibly maintain a pegged currency amidst $7.9 trillion of unreported capital outflows over the last fifteen years and have accumulated $3.8 trillion in foreign reserves at the same time? If the yuan were a freely traded currency in open capital markets, net capital outflows of this magnitude would have already driven its value down sharply. Not so with a pegged currency. With a pegged currency, a country’s central bank must make the bid or offer on its currency at the fixed rate in order to maintain the peg. So, as the Chinese elites have been buying property abroad at record levels, sending their kids abroad for education, sending their wives abroad to give birth, and parking their financial assets in tax havens and shell companies, they have been selling their yuan and converting it to dollars and other currencies in the process. In such an environment, in the middle of all of this yuan exchange, we believe it’s the People’s Bank of China (PBOC) that’s been there all along, making the bid on the yuan to facilitate these outflows. This means that the PBOC has been selling dollars and buying yuan in the global FX derivatives markets, in order to maintain the peg. But these FX trades with large foreign global banks require collateral. These banks are not dumb. We believe China has encumbered its foreign reserves in the process. So, amidst $7.9 trillion in illicit net outflows in the last fifteen years, it is extremely reasonable that the PBOC has already pledged all of its $3.8 trillion in foreign reserves to maintain the dollar peg. If the PBOC has made the bid on the entire outflow, it could actually be net short as much as $4.1 trillion USD, rather than net long $3.8 trillion in foreign reserves. If China is indeed net short the dollar, this problem is becoming particularly acute now that the dollar is rising against all major global currencies. We believe China is not just facing an economic slowdown today. We believe it is on the verge of a meltdown and that the PBOC is facing a margin call on what has been an ever increasing dollar short position. We think the PBOC will soon have no choice but to abandon its peg to the dollar and dramatically weaken its currency. Party leaders will come up with an excuse to justify it as an easing, saying that it is to boost the economy, that any currency devaluation is just a temporary adjustment. 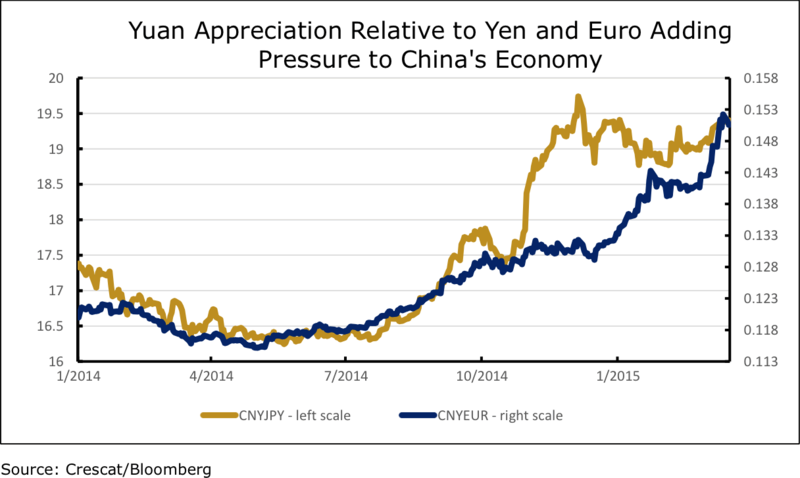 With the yuan pegged to the dollar and with the euro and yen declining versus the dollar, the yuan has actually been appreciating recently versus Japan and Europe, two of China’s major export trade partners – as we show in the chart below – which is further hurting China’s economy today. So, another reason that China will be forced to abandon the peg to the dollar is to boost its export business with Japan and Europe (not to mention the U.S.). The initial devaluation will be promoted as a temporary minor adjustment, a preparation for ultimately fully opening up the capital account in order to entice foreign inflows under the false promise of a strong currency, a global reserve currency. Don’t believe it. This is a trap. We expect a sharp devaluation of the yuan. We expect at least a 25% drop in the value of the yuan against the dollar, very possibly within the next year. It ultimately could be much more than that. We continue to implement our China Currency and Credit Bubble theme in our Global Macro fund through extraordinarily cheap (thanks to the still pegged currency) call options on USDCNY that settle in dollars. We also continue to short casino companies with the Macau exposure (MGM Resorts International, and Wynn Resorts). In addition, Crescat remains short copper- and iron ore-related business (Southern Copper, Rio Tinto, Freeport-McMoRan, Vale SA-SP, and the iShares MSCI Chile Capped ETF) as well as Brazilian equities that have export exposure to China. The Brazilian economy has again been suffering from an old and remarkable enemy: inflation. We have recently increased our short positions there. Brazil is being effected by cost-push inflation due to its declining currency and trade deficit, which could lead to worse woes. In order to address this situation, the central bank has been pressured to raise interest rates in the last few months. Brazil’s current account deficit has recently reached about 4% of its GDP. However, we think the deficit will deteriorate even more due to two factors: Lower export demand and higher import prices. China accounts for a significant amount of Brazil’s exports and its slowdown is already dragging on Brazil’s economy. Also, with current credit levels, we could see two possible scenarios: A currency crisis or a banking crisis. Both routes would severely pressure demand for exports and continue to weigh on the real. Furthermore, with the U.S. economy at a more comfortable state, and a better labor market, we expect the Fed to raise interest rates this year. This could put even more downward pressure on the Brazilian real relative to the dollar, further worsening Brazil’s current account deficit. Crescat has select short exposure to Brazilian stocks, including through an ETF security, to capture alpha from both the deteriorating Brazilian economy and its currency. Crescat Portfolio Management LLC is an asset management firm headquartered in Denver, Colorado. The firm claims compliance with the Global Investment Performance Standards (GIPS®). Investors and prospective investors can access the latest GIPS compliant performance presentations and list and descriptions of composites on our website at www.crescat.net or by contacting Linda Smith at 303-228-7371. Crescat funds are being offered in reliance on an exemption from the registration requirements of the Securities Act of 1933 and are not required to comply with specific disclosure requirements that apply to registration under the Securities Act. The SEC has not passed upon the merits of or given its approval to the Crescat funds, the terms of the offering, or the accuracy or completeness of any offering materials. A registration statement has not been filed for any Crescat fund with the SEC. Limited partner interests in the Crescat funds are subject to legal restrictions on transfer and resale. Investors should not assume they will be able to resell their securities. Investing in securities involves risk. Investors should be able to bear the loss of their investment. Investments in the Crescat funds are not subject to the protections of the Investment Company Act of 1940. Performance data represents past performance, and past performance does not guarantee future results. Performance data is subject to revision following each monthly reconciliation and annual audit. Current performance may be lower or higher than the performance data presented. Crescat is not required by law to follow any standard methodology when calculating and representing performance data. The performance of Crescat funds may not be directly comparable to the performance of other private or registered funds. Investors may obtain the most current performance data and private offering memorandum for a Crescat fund by contacting Linda Smith at lsmith@crescat.net or (303) 228-7371. See the private offering memorandum for each Crescat fund for complete information and risk factors.